Bayview Framing & Art specializes in quality custom picture framing using 100% conservation materials and top quality workmanship. 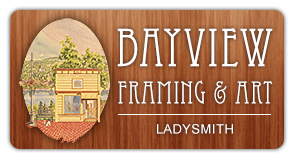 Bayview Framing & Art has been a part of downtown Ladysmith since 2000. In 2010, it was sold by Mike Moulds, who founded the business with Wendy Rawluk, to Wanda Dombrowski.Bayview Framing’s home is Nicholson Cottage, built in 1900 as a family home by Dan Nicholson, who later became a mayor of Ladysmith. Wanda is a painter and she and her husband Bruce Whittington, a photographer, were former Bayview customers.